Hello, hockey fans! Welcome to Vavel's LIVE coverage of the exciting Western Conference Finals series featuring the Vegas Golden Knights and the Winnipeg Jets. The Game 5 action will start at 3 pm ET from Bell MTS Place in Winnipeg. The upstart Vegas Golden Knights are showing every hockey fan and pundit that they are for real, and are now competing to go to the Stanley Cup Finals in their very FIRST season of existence! How is that possible? They have put together an offensive team with fire and power, and a defensive team led by the outstanding goaltending skills of Marc-Andre Fleury. 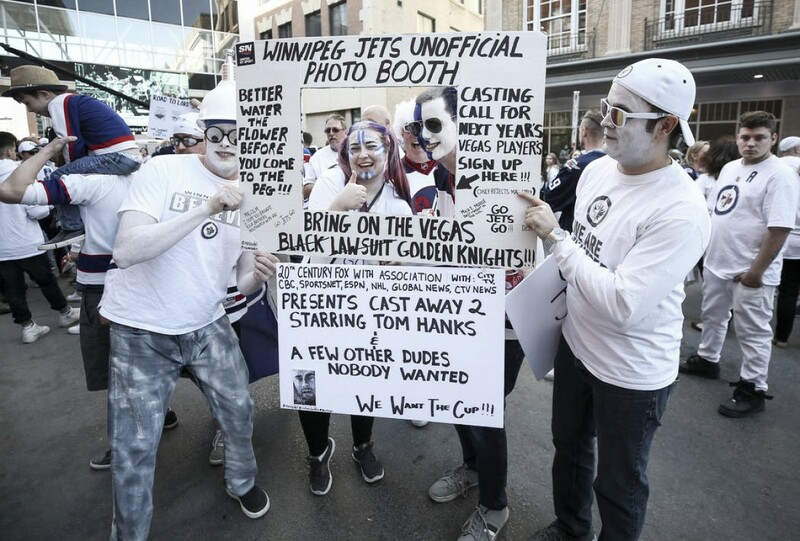 The first two games were split in Winnipeg with the Jets winning Game 1, and the Golden Knights coming back to take Game 2. Then in Games 3 and 4 in Vegas, the home team took both games to put the Jets near elimination trailing three games to one. Who's been the star of this series? It's gotta be none other than Marc-Andre Fleury. His stats speak for themselves and his fantastic, acrobatic saves have been the highlight of this series. Touting an excellent 11-3 record and the best in the playoffs goals against average of 1.72 to go along with the best save percentage of .945, the Jets must figure out Fleury if they intend to keep playing in the postseason. He also has four shutouts to further complicate Winnipeg's formula for getting pucks by him. The key of this series may be who can win at home. The Golden Knights have won both their home games, but Winnipeg has only won the first of two games on their home ice. Winnipeg does have home-ice advantage, but lost it by losing the second game of series. It is now a three-game series, but Vegas just needs to win one game to move onto the Cup Finals. The way it looks now if Vegas can take this Game 5, and with the Tampa Bay Lightning winning their series 3-2, we could very well see a Vegas vs Tampa Cup Finals. What a matchup! Special teams always make a difference in any playoff series, and this one is no different. The Vegas club has a power play percentage of 18.4 per cent, while the Winnipeg team is much better with a 26.7 success rate. That means that the Golden Knights need to play a disciplined game and not allow the Jets to take off into the stratosphere with their powerful offensive players like Mark Scheifele, Blake Wheeler, or Patrik Laine. Vegas does possess a strong penalty kill of 81.1 percent compared to Winnipeg's 75 percent. The key offensive players in this series have been Jonathan Marchessault for Vegas with four goals, three assists. Wheeler has no goals, six assists to lead the Jets scoring. It seems that when Vegas scores the first goal, they have a terrific shot at winning the game. They are 9-1 in games where they have scored first, so watch for the Jets to press and get that all important initial goal by Fleury... that is IF they can! Game time is coming right up shortly, so grab a cold one and join me, William, the Editor of NHL Vavel as I bring to you the exciting action of Game 5. Will Vegas be moving on to the CUP FINALS, or will Winnipeg have something to say about it? WATCH SOON... and thanks for following the NHL action here on your best option for the NHL... VAVEL! It looks like Jets' head coach Paul Maurice will mix up his starting lineup to try and send this series back to Las Vegas. He is replacing defensemen Toby Enstrom and Ben Chiarot with Dmitry Kulikov and Joe Morrow. In addition, Andrew Copp is benched in favor of Joel Armia. WE'RE SET TO GO!! The Jets' pumped up fans are going crazy... our national anthems and then the PUCK DROP. The two top lines will start the game. The team who scores first in all four games has won the game. The first goal will be HUGE. Connor Hellebuyck's puck handling could be an issue, as he has made some mistakes resulting in scoring chances or goals. 17:17: Dustin Bufuglien two minutes for slashing.Vegas in the power play. Winnipeg kills off the penalty. Alex Tuch scores at 5:11. Vegas scores first again. 1-0 Vegas. Tuch got a gift as the puck deflected off a Jets' player right to his stick in the slot. Good wrist shot got it by Hellebuyck. Timeout, as Vegas is dominating shots on goal bya 7-1 margin. The pressure by Vegas is showing them success for puck possession and scoring chances. Reilly Smith came racing down the right wing after a Jet turnover and was stopped by Hellebuyck short side. Fleury stopped the rushing Bufuglien as he attacked the Vegas net, and drew a penalty at the 7:15 mark. Colin Miller got called for interference. Jets on the power play looking to tie the game. Vegas kills off the penalty missing two good chances by shooting wide of the net, or shooting over the net. The Jets have been dominating play and have caught up with Vegas with seven shots on the net. Winnipeg Jets score! 1-1. Bryan Little won the faceoff and it went right to Josh Morrissey whose slapshot beat Fleury. The crowd immediately chanted "FLEURY, FLEURY" to get into the goalie's head. As the period ended a scrum ensued at the center red line, and the officials broke it up. The Jets ended up with a 12-8 shot advantage as they put lots of pressure on the Vegas net. Marchessault had a shot on goal in the first half minute stopped by Hellebuyck. Nate Schmidt almost got one by Hellebuyck when it bounced off the goalie and hit the right post before it was frozen. Kulikov was called for elbowing at 3:51. Vegas power play unit is on the ice for their second man advantage in the contest. Winnipeg was successful in killing off the penalty. Tuch called for tripping at 9:01. Jets on the power play. Bufuglien saved a sure breakaway attempt on the right point as he was just able to bat the puck away from a streaking Reilly Smith. At the 8:12 mark of the second, the Jets are out-shooting the Golden Knights 21-17. James Neal shot one from the left wing that Hellebuyck fought off as it deflected up in front of him. Ryan Reaves scores at 13:22! Vegas ahead 2-1. Luca Sbisa shot one from just inside the left point blue line that Reaves was able deflect past Hellebuyck. 16:03: Tomas Nosek is called or tripping giving the Jets a power play chance to tie the game again. Vegas kills off another penalty to thwart the Jets' attempt to catch up. Both teams are scoreless in the man advantage in this game. 2.8 seconds faceoff in the Jets' end. END OF SECOND PERIOD. Vegas leads 2-1. Third period begins with the Jets having yet another power play with Marchessault going off for slashing 45 seconds in the third. Vegas kills the penalty off. The Vegas Golden Knights are just 15 minutes away from advancing to the Cup Finals...can they do it? Morrissey collided with Tuch and looked hurt going t28-27o the Jets' bench. 12:40 left for the Vegas club to try and hold off the Jets, who are feeling the pressure of needing a goal. The next goal will BIG. Vegas is playing defense in an attempt to hold off any Winnipeg surge. Shots are 28-27 Winnipeg. Karlsson had a good backhand chance cutting in front of Hellebuyck which was stopped. One key to stopping the Jets is being able to stop Scheifele who has just one shot on goal. He has been played very tightly by the Vegas defense. Five minutes left in the third period. Vegas is outplaying the Jets in this third period and with just 2:45 left the Golden Knights are feeling it. 1:24 left and the Jets pull their goalie. A 500-1 SHOT TO GO TO THE CUP FINALS AND THE VEGAS GOLDEN KNIGHTS ARE THERE! FINAL SCORE: VEGAS GOLDEN KNIGHTS 2, WINNIPEG JETS 1.